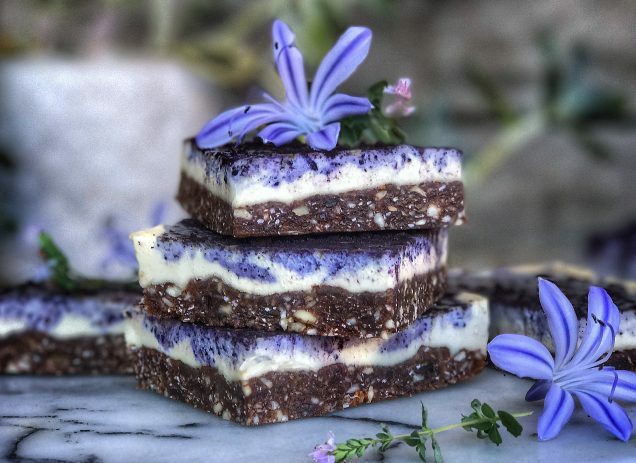 Rawspirations | Raw Vegan Blueberry, Vanilla & Maca Cheesecakes! Raw Vegan Blueberry, Vanilla & Maca Cheesecakes! Light, fresh, and delicious, this raw vegan cheesecake literally just melts in your mouth like chocolate. The secret ingredient is cacao butter which is what gives it that creamy silkiness to the texture! I like to enjoy a slice at afternoon tea or dessert, its also a good one to make and keep in the freezer for when those unexpected guests pop over! Blitz base ingredients into small bits and so that they stick together. Press into rectangular or square flan tin that has a push out base. Place all ingredients (except blueberries) into a high speed blender and blend on highest speed until very smooth and creamy. stop a few times to scrape down sides. Pour half the mixture over base. Place blueberries into remaining mixture in blender and pulse on highest speed until very smooth and creamy. Pour over vanilla layer. Optional – (sift macqui berry powder and coconut sugar over the top). Freeze over night. Slice when ready to serve!